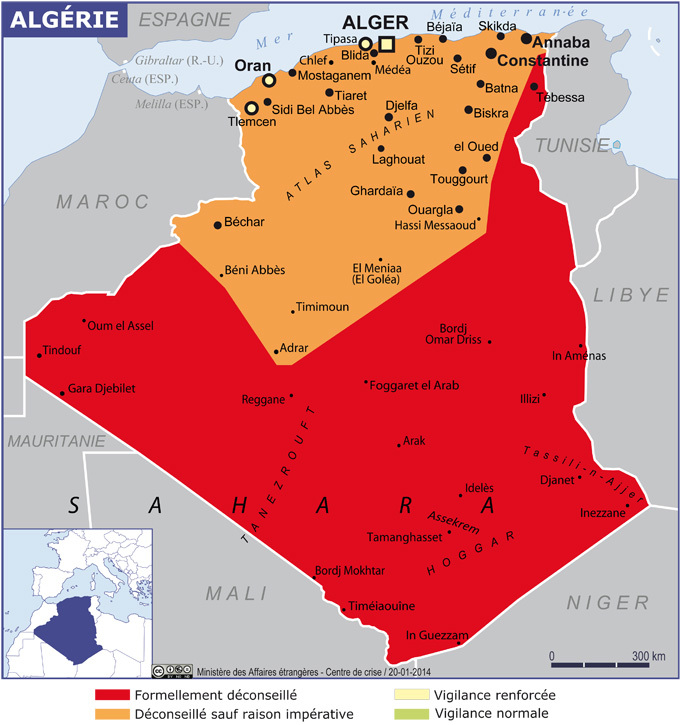 Avoid travel within 50 km (31 miles) of the eastern border and within 450 km (280 miles) of the southern border. On both Dutch and French charts red means "No travel" and orange means "Only necessary travel". So I might have to wait a bit with this trip after all. But why do those travel advisories diverge so much? 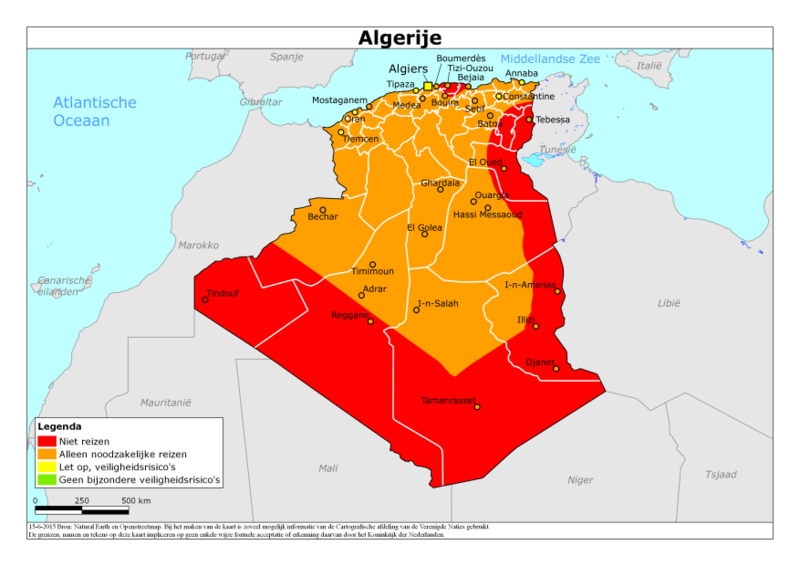 In large areas of the country, the FCO does not advise against travel at all, the US and Dutch government advice against all but essential travel, and the French government advice against all travel. That's the difference between the safest and least-safe category: a very large difference. Is it safer for UK than for US or French citizens? Is the UK government more optimistic? More up-to-date? Or are there other reasons to explain the discrepancy? The most obvious answer may be that these advisories are highly subjective. The danger level is hard to assess, is likely constantly changing, and in some situations will affect nationals of some countries more than those of others (e.g. when militants target citizens of certain countries or of certain religions). Some countries assess the risk level using their own resources in the second country; others rely on the assessments of other countries. Some countries likely share intelligence to make their assessments more accurate. Some may simply use publicly-available information to make their assessments. I think you're doing the right thing by aggregating multiple assessments. This lets you make a better-informed decision. Risk assessment also take into account the nationality and culture of the travelers, as well as reports of other recent travelers. So if the US has 30 people visit a country in one year, and one person is assaulted, but the dutch only have 2 people visit, one of which is assaulted, they might simply not have enough information to make a great recommendation due to low sample size. Alternately, Americans might be more poorly received, or more likely to be targeted for ransom compared to someone from the EU. Lastly, travelers from one country might be slightly more comfortable around people who are armed compared to someone from a country with more strict gun regulation, so travelers to a country where guns are more available might not be as comfortable to travelers from the gun restricted country vs a traveler who is used to them. Because the advisories are snapshots from when they were created, which isn't always as recently as you might hope. If you look at the "last updated" stamps on those websites, you will get a very nice picture of the danger going down in time (worst in 2014 from the french map to best in 2017 on the FCO one). This also lines up well with the info actually given on the US site which notes that the danger has been decreasing steadily. Not the answer you're looking for? 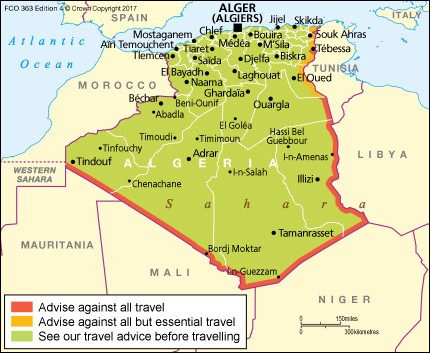 Browse other questions tagged safety algeria or ask your own question. Why is it considered so dangerous to travel in South Africa? Which parts of Southern Thailand are safe from violence?